This preliminary informational bulletin provides technicians with repair information on removing seized exhaust temperature sensors. 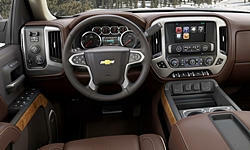 This preliminary informational bulletin adds the 2015 chevrolet colorado and gmc canyon to diagnosis and repair information to correct a customer concern of alleged no park, vehicle rolls in park or park will not hold. This preliminary informational bulletin provides additional information for possible causes in vibration and how to diagnose them. This preliminary information communication advises the technician that the hydro-boost is not serviceable and will need to be replaced if the brake pedal moves or applies on its own at a full turn. This preliminary information communication advises the technician that there is a new dot 3 brake fluid for the 2014 silverado and sierra 1500. technician can order the new dot 3 brake fluid from their parts department. This preliminary informational bulletin provides diagnosis and repair information to correct a customer concern of alleged no park or vehicle rolls in park or park will not hold. This technical bulletin provides repair information for the re-torque of leaf spring bolts to correct a customer concern for a clunking noise coming from the rear of the vehicle. This informational bulletin provides warranty policy information on revised wiring repair labor operations and required additional information. This preliminary information communication provides information to the technician the steps needed to diagnose and repair vehicles with a rough idle and/or vibration at idle in drive. this condition will not be present in park, or neutral. This preliminary information communication provides information to the technician on the step needed to diagnose and repair vehicles that may have uneven brake pad wear. technician will need to inspect and measure the brake pads thickness. This preliminary information communication advises the technician on the steps to diagnose the concern. customer hears a clunk when stopping or launching. This preliminary information communication advises the technician on the steps required for the front shock absorber terminal removal. This informational bulletin provides additional information about the def use and treatment of the fluid. This preliminary information communication advises the technician on the steps to diagnose and repair the concern of the service engine soon light is on, and the engine has low oil pressure. This technical bulletin provides a procedure to re-torque the joints of the rear leaf spring assembly to correct a customer concern of a clunking noise coming from the rear of the vehicle. This informational bulletin provides information on changes in exhaust tone for active fuel management engines when in three or four cylinder mode. This informational bulletin provides information on a engine knock on cold start. Gmc/chevrolet: to assist engineering product feedback, parts for duramax diesel engine, has been placed on restrictions, by product quality center (pqc). model 2010-16 duramax. Chevrolet/gmc: on trucks/suvs after having an oil and filter change, the pressure for oil is low and ses light had diagnostic trouble code (dtc) p0521 appear. model 2014-15 silverado, suburban, tahoe, sierra, yukon, yukon xl. Chevrolet/gmc: on some vehicles, accessory drive idler pulley will be replaced due to noise in bearing and pulley may fail and alternator and water pump stop working. Chevrolet/gmc: after ignition key has turned engine off, it remains running a possible caused maybe du to installation of a fuse in f26ua and/or f31ua location of ubec. 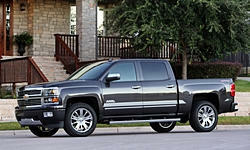 model 2014 silverado 1500, sierra 1500, 2015 silverado, sierra. Gmc/chevrolet: engines, with egr system, has leakage from egr cooler engine coolant into the combustion chamber. model 2002-15 silverado, sierra, 2004-09 kodiak c4500-c5500, topkick c4500-c5500, 2006-15 express, savana. Gmc/chevrolet: at bottom of flywheel housing, a leak is found, causing a fuel odor, due to high pressure pump to high pressure line fitting or fuel rail connection. 2010-2015 express, sierra, savana, silverado. This preliminary bulletin provides a procedure on how to cold crank test a battery in a vehicle. This preliminary informational bulletin provides informationto the technicians of a fluid leak from the front of the allison transmission and to gather information on the transmission. This information bulletin provides a procedure for the technicians to perform a transmission re-learn to correct a customer concern of low milage harsh shifting. This preliminary informational bulletin provides diagnostic tips for a customer concern of illuminated mil or technicians finding dtc p2818: transmission control solenoid valve'8 stuck on. This preliminary information communicates that the product quality center transmission exchange 8l90 8 speed automatic transmission has ended. This preliminary informational bulletin provides procedures to inspect , replace, or repair the xm radio antenna to correct the customers concern loss xm services, noise and/or water leak. This preliminary information bulletin advises the technician that there is no update for the customers concerns of the gm remote start doesn't work with the onstar remotelink phone application. This preliminary bulletin explains that the customers concern of the rear seat entertainment dome lamps when the turn signals or brakes are used, engineering is aware of the condition and are working on a resolution. This pi provides a procedure to update the instrument cluster properly and completely and what steps to take if the link between the tools were to become dis-connected. This preliminary information bulletin provides a procedure on reprograming the hmi module to repair the customers concern of the blank screen after start up, rear view camera on, touch screen inop, bluetooth and navigation concerns. This preliminary information provides a procedure to update the radio to correct the cutomers concern of no xm, radio locks up, slow response time, vertical lines between the clock and temp guage, and poor fm reception. This informational bulletin communicates gm wiring repair strategy information. This preliminary informational bulletin provides information on a procedure for diagnosing and repairing vibrations caused by the wheel and tire, axle components and/or propeller shafts. This preliminary bulletin provides a procedure to reprogram the radio to correct the customers concern of poor radio reception. This preliminary information communication advises the technician on diagnosing the concern of the cd player being inoperative or disc will not eject. This preliminary information communication advises the technician on the steps to diagnose and repair the concern of a dead battery after leaving the vehicle during a bluetooth call. This technical bulletin provides a procedure to reprogram the rear entertainment media disc player using a provided dvd to correct the condition of the rear entertainment player freezes on start up menu due to a calibration concern. This preliminary information communication advises the technician of the steps for diagnosing and repairing the concern when the vehicle has a water leak and or wind noise from sunroof. Gmc/chevrolet: the headlights on some snow plow equipment becomes inoperative after switching from factory to snow plow usage. model 2014 silverado 1500, 2014 silverado, 2014 sierra 1500, 2015 sierra. This preliminary informational bulletin contains recommendations of what needs to be done to swap/install camper outside rearview mirrors on a vehicle not originally equipped with them. This preliminary bulletin provides a procedure to replace the outside mirriors with camper style mirriors for the customer request. This technical bulletin provides repair information to correct a customer concern of hearing a squeak noise from the driver or passenger front door armrest area. This preliminary informational bulletin adds the 2016 model year to repair information to correct a customer concern of the hood fluttering, vibrating or displaying visible motion at highway speeds or over rough road surfaces. This preliminary information provides a procedure to apply grease to the seat track to correct the costomer concern of excessive movement and a click noise while driving. This preliminary information communication advises the technician that the rear safety belt child comfort guide kits are available from customer care and aftersales parts as part number 20944862. This informational bulletin explains not to put multiple keys on one key ring and how to tag a key. This preliminary informational bulletin outlines the recommendations and procedures for diagnosing and repairing vibrations caused by wheel and tire, axle components and/or propeller shafts. This engineering informational bulletin is requesting information from the field with the conditons of a rattle noise originating from the second row seat. This preliminary information communication provides information to the technician about vehicles that have speedometer inaccurate reads 5 mph when traveling 50 mph. engineering is working to develop a solution. This informational bulletin provides a list of parts/replacement parts for the tonneau covers. This preliminary information communication advises the technician the diesel oxidation converter part restriction has ended. dealer can now order the parts through the regular customer care and aftersales parts process. This preliminary bulletin provides a information on how to remove the seized temperature sensors from the dpf. This information bulletin provide information on a new way to look at nox sensor readings and exhaust temperature during a dpf regeneration or a reductant fluid quality test. This informational bulletin is a supplement to the duramax diesel coolant system fill and head gasket replacement procedure found in the service information. This preliminary information communicates to the dealer the steps to repair the concern when the customer sees wear marks on the tailgate. This engineering information bulletin announces the end for the need of information on rear bumper step pad melted or warped. This technical bulletin provides repair information on correcting a water leak into the vehicle cabin, caused by water overrunning the power rear slider window channel. Stop delivery order. laser weld investigation. This technical bulletin provides a procedure to reprogram the radio to correct a customer concern that there is a low-volume, repetitive ticking noise coming from all speakers due to the current radio software. This engineering information bulletin is requesting information from the dealers on a customer concern that the rear bumper step pad is melted or warped. This informational bulletin provides genernal information on spray-in bed liners and how to repair it. This informational bulletin provides information on the importance of lubricating the left tailgate hinge which incorporates an assist mechanism. This informational bulletin provides information on replacement parts for the tonneau cover. Chevrolet/gmc: on some trucks, trouble locating the two blunt cut wires, for roof beacon light, which is directly above overhead console and taped to harness. model 2014-2015 silverado, silverado 1500, sierra, sierra 1500.